Learn about layer rooms here. Layer rooms provide 3 layers for everyone to draw on. The tools are the same except it adds the hard eraser, which allows erasing through all 3 layers at once. Layer 3 lines will appear over any other lines made on the other layers. Typically your finished line-art will go here. Layer 2 will appear over layer 1, but below layer 3. Typically you’ll have your draft and sketches here. Layer 1 will appear below the other 2 layers. Typically this makes it ideal for coloring underneath the lines on the other layers. When working on one layer you may find another layer’s lines being distracting. 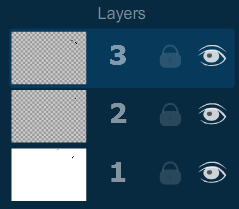 To remedy this you can click on the eyeball located on the layer’s panel, and it will hide that layer. Once a layer is hidden you cannot draw on it. Hiding a layer only affects your client and other users can still see it. Save a layer by right clicking on them in the layer panel. With the correct privilege, you can clear each layer individually. Clear a layer by right clicking on the layer you want to clear in the layer’s panel, and selecting to click it in the context menu. Alternatively you can type the /cls <layer number> command into the chat. With the correct privilege, you can merge layers. When you merge a layer you move it into another layer. The layer you moved it from will become empty. Merge a layer by right clicking on the layer you wish to move, and selecting the layer you want to merge it with in the context menu. With the correct privilege, you can lock layers. Locking a layer will prevent anyone without the proper privilege from drawing on the locked layer. Lock a layer by clicking the lock icon next to the layer on the layer’s panel. With the correct privilege, you can flip layers. You can flip them vertically or horizontally. Flip a layer by right clicking it in the layers panel, and choosing which direction you want to flip it in the context menu.